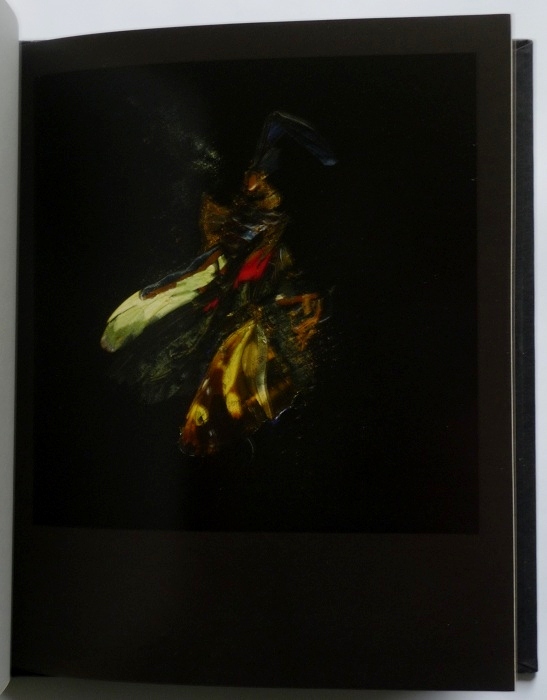 By now you will no doubt know that I like Mat Collishaw’s Insecticide series. 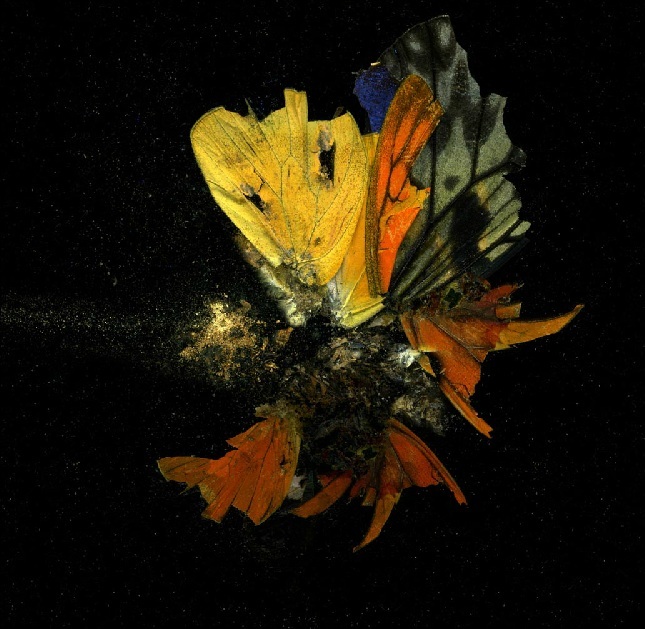 As part of the London 2012 cultural festival that surrounds the Olympics, Collishaw has teamed up with UK designer Matthew Williamson to reinterpret one of his Insecticide images which can be seen here. To tie in with this, I thought I would post the final installment of my Insecticide collection. 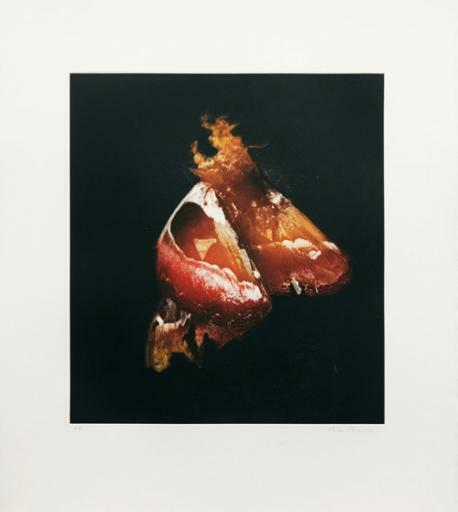 Here is Insecticide 28, a print I recently bought from Mat Collishaw. I believe this is one of his more recent images in the series, it is not documented in the Insecticides catalogue I recently posted. To find out more about this body of work click here for a full run down of all my Collishaw posts to date. 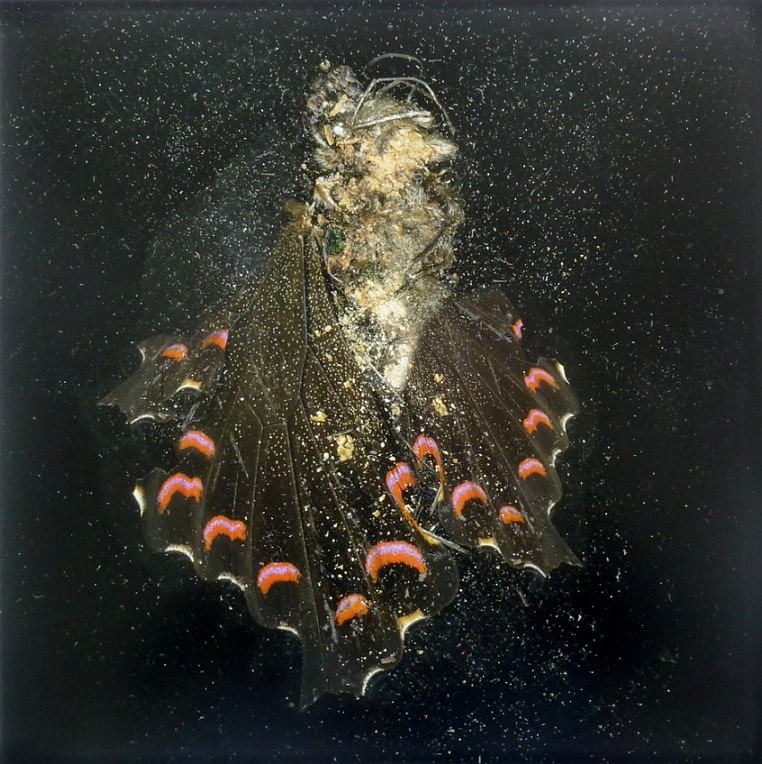 For those who follow my blog, I’m pretty sure you’ll have gathered I’m a great admirer of Mat Collishaw’s work, particularly his Insecticide series. The series consists of high resolution images of squashed moths and butterflies that the artist found in his studio. The resulting images are, at times, visceral and abstract; it is hard to discern the individual body parts, only traces, colours and forms remain. 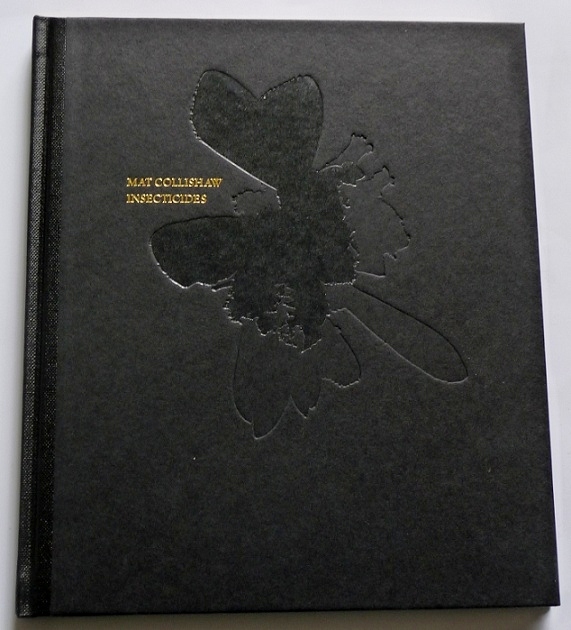 In 2009, Collishaw collated his Insecticide images into a signed, limited edition (500 copies) hardback book. The book itself is stunning, the cover is embossed with the title stamped in gold and the pages are gilt edged. 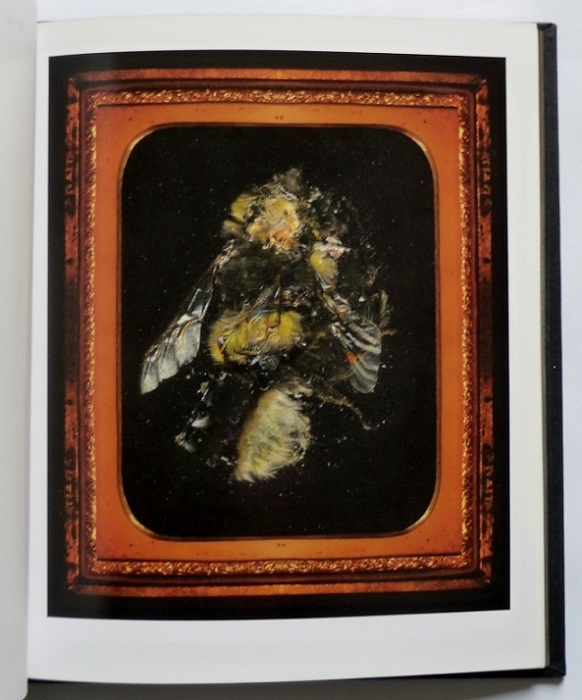 Inside the images are separated in to Insecticides I and II, the images in the first series have the look of a Victorian lepidopterists study whereas the second series is much more sleek and graphic. Each image is printed on high gloss paper and is protected by a vellum sheet. Unsurprisingly, the book sold out quickly and is hard to find online (there is one for sale on Amazon). 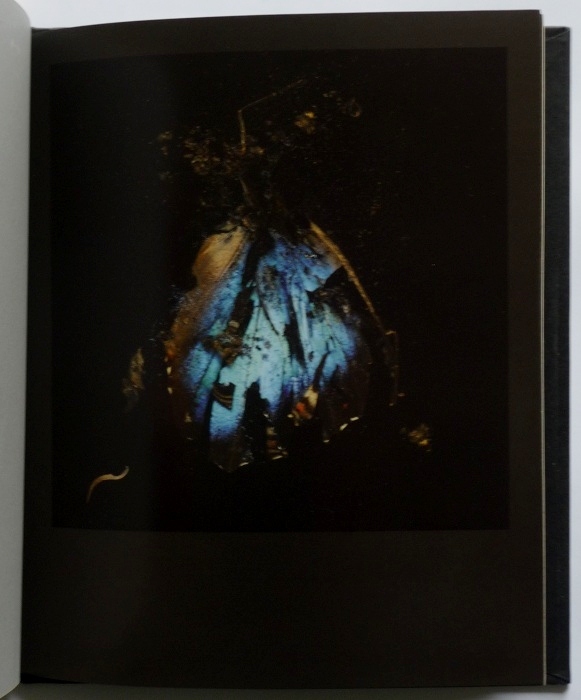 This isn’t the end of my Insecticide posts just yet, I recently bought a new Insecticide print from Mat Collishaw that is not in the book which I will post soon. Until now I have used this blog just for my book and print collection but from today I will also start posting about the private views and exhibitions I attend. First up is Mat Collishaw’s new work The End Of Innocence which I attended the private view of last night. In this piece, Collishaw has created a digital reinterpretation of Francis Bacon’s appropriation of Velazquez’s Pope Innocent X. The work is in a constant state of flux; as blocks of colour run down the screen like water, the image shifts and morphs so that Bacon’s work slips in and out of view. The work is epic in scale (around 7m tall) and, fittingly, occupies an entire wall of a converted church in Southwark park. Below is a video of the work, although watching on a computer screen doesn’t do it justice, it has to be seen up close and in the flesh to be fully appreciated. The End Of Innocence is on display until the 27th May at Dilston Grove and is definitely worth a visit. 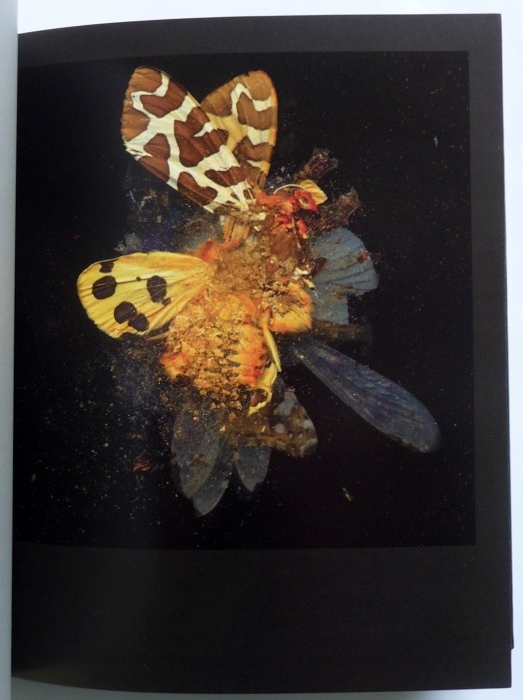 I have posted about my love of Mat Collishaw‘s Insecticide series of photos before and having just got back from seeing his latest exhibition at Tanya Bonakdar gallery in NYC, I thought I would post another of his prints I own. This tinted photogravure was produced to coincide with his 2009 exhibition at Haunch of Venison. This print is quite different from the rest of his Insecticide images as it is not as hyper-real in its detail. The use of the photogravure process to produce this image gives it a much more ethereal ghost-like quality. The print was produced in an edition of 100 and measures 64.5×58.1cm. For any of you passing through NYC soon, I really recommend you check out Collishaw’s “Vitacide” exhibition at Tanya Bonakdar which runs until 18th February. The exhibition consists of vitrines containing sculptures of diseased and decaying plants that look like they have been torn from polluted wasteland. At the end of the room is a video installation, projected through an altar-like frame, of plants blooming and decaying. In addition, the exhibition includes images from the Insecticide series as well as his series of images of last meal requests from death row inmates that were recently published in Time magazine. Mat Collishaw is one of the original YBAs (young british artists) that exhibited at the legendary Freeze show in 1989. His work often has a very dark sinister edge to it, but at the same time, a richness of colour and detail. In 2009 Mat Collishaw had an exhibition at Haunch of Venison where he unveiled his latest body of work entitled “Insecticides”. 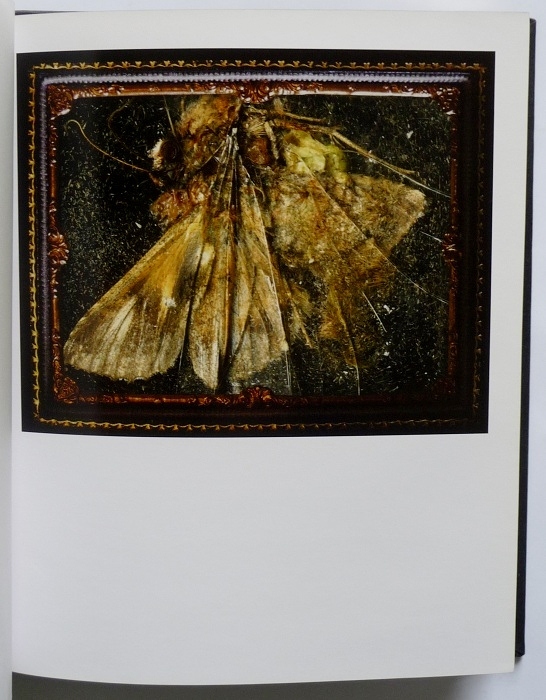 This series of work captured insects at their moment of death; Collishaw called the images “degraded and violent memorials to a once living form”. 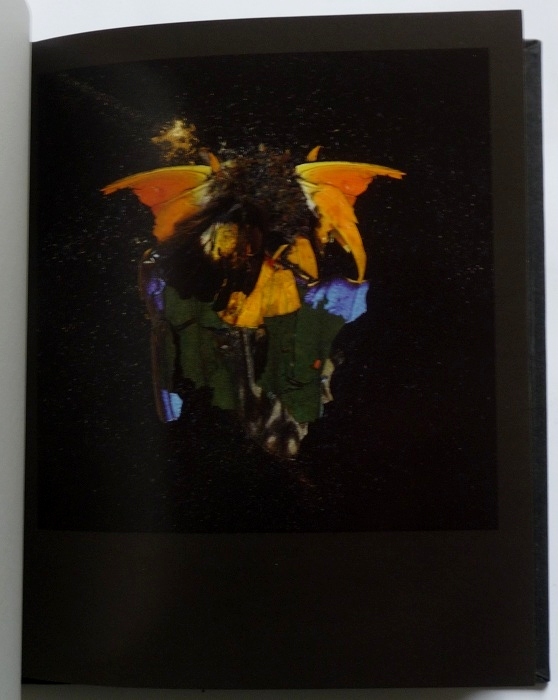 In conjunction with the exhibition, Collishaw released Insecticide 13 as a limited edition print. The print is in an edition of 200 and is 40x40cm; it can be ordered from Blain Southern who represent him.